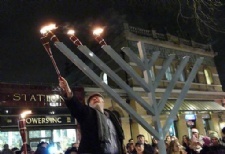 Thousands of people up and down the country attended one of the many Chabad Lubavitch menorah lighting ceremonies and events that took place for Chanukah 5772. 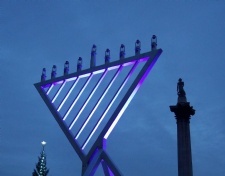 Aside from the organised events, Chabad worked tirelessly in the lead up to Chanukah to ensure public menorah's were on display in places such as the Park Lane intersection in Central London, Brent Cross Shopping Centre and Heathrow Airport. In Central London over 2000 people came to Trafalgar Square for an event where Mayor of London Boris Johnson was the guest speaker. Over 100 people gathered outside Gloucester Road underground station for an event organised by Rabbi Mendy Loewenthal at Chabad of South Kensington. Guest of honour, Mayor of the Royal Borough of Kensington and Chelsea, Councillor Julie Mills spoke about the importance of tolerance and unity. 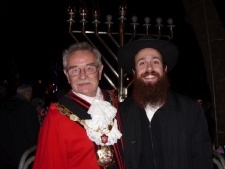 In Islington, the Mayor of Islington Phil Kelly joined large crowds for the first ever public menorah lighting in Islington Green organised by Rabbi Mendy Korer. In Southgate, Rabbi Zvi Kesselman coordinated ceremonies that took place each night (except Shabbat) with special guests including President of the United Synagogue, Stephen Pack and world renowned chazan Dov Speier. 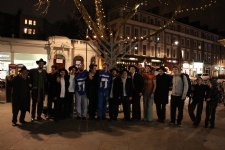 In Shoreditch, Rabbi Mendel Cohen coordinated the distribution of Menorah Kits at the famous Spitalfields market. 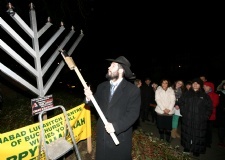 In Essex, over 150 people came to Chabad of Buckhurst Hill's annual lighting ceremony on Queens Road. In previous years Rabbi Odom Brandman has coordinated creative Menorah projects which have seen a Whisky Menorah, a Can Menorah and a Recycled phones Menorah. This year the main feature was a Coin Menorah. Prior to Chanukah Chabad collected donations in spare change totalling £2,009.95 made up of 50,773 coins. At London Heathrow, Rabbi Hershi Vogel met over 250 people each night at the ELAL Flight gate for a ceremony prior to boarding flights to Israel. 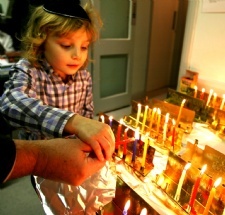 Due to term time being outside of when Chanukah occurred, Chabad on Campus organised a number of pre-Chanukah events for students around the country. On Liverpool Campus Rabbi Shmuli Brown organised a 'Mega Pre-Chanukah Bash' for students with latkes, doughnuts, competitions and prizes. Other events took place in Chabad Centres and public locations in Glasgow, Edinburgh, Manchester, Leeds, Nottingham, Bristol, Birmingham, Oxford, Cambridge, Ilford, Bournemouth, Sussex, Hertfordshire and all over London.